The Jogger Stun is a self defense device which disrupts the message the brain sends to the voluntary muscles. Simply touching an attacker with a stun gun for 3-5 seconds will deliver a high voltage shock causing loss of balance and muscle control, confusion, and disorientation bringing him to his knees and making him incapable of further aggressive activity. Full recovery takes about five to ten minutes and there is no permanent harm. This Cheetah stun gun is a triple threat when it comes to personal protection and self defense! 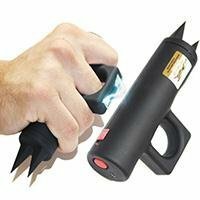 Its unique design offers a stun gun that can incapacitate an attacker with just a touch, a defensive knuckle for pommeling assailants, and piercingly sharp kubaton-style double spikes on the end for strikes and hammer fist punches. At only 5.5" in length, it is compact but powerful. Includes a leather holster FREE. Stay Safe with the Cheetah KU Stun Gun. The Cheetah Jogger Stun 4.8 Million Volts Rechargeable Stun Gun (Model CH-41) is perfect for joggers and walkers – fits easily in hand when in motion. That’s a huge concern – as you don’t have to fumble for it when you need it and thereby take your eyes off looming danger. Has pointed spikes on the end for a nasty yet persuasive hammer-fist strike. Leather Holster Included. Although it is small enough to carry in your pocket, it can be clipped to your belt or purse, or carried in the included holster with belt loop. Dimensions: 5.5" x 1.75" x 0.88"